Trade show exhibit booth design. Example:Columns made with Chameleon™ hang 'square' and can be used for projection, lighting effects including revealing the ribbon dancers within them. Chameleon™ scrim can be used to create 3-D objects. The example at left shows two 40 foot tall columns each 8 feet in diameter. 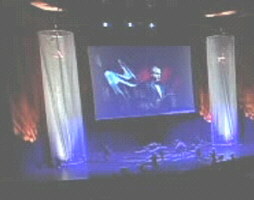 Columns and other 3-D objects can create scrim effects--like projection or revealing dancers within as shown in the photos on the left. 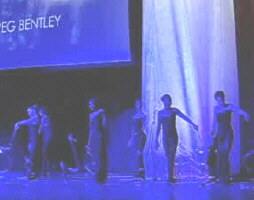 Click here to see a video of the entire spectacular event produced by Brandbridge Ltd, www.brandbridgeltd.com. Chameleon™ is a large surface for printing, projection and special effects. Using shapes can add a whole new dimension to design.